THE HISTORY AND CULTURE OF HUNTINGTON BEACH is so steeped in surfing that this So Cal beach town has been coined Surf City USA. Huntington Beach is home of George Freeth, the first surfer in the United States, the first wood carved surf boards, dozens of world champions, and the International Surfing Museum. 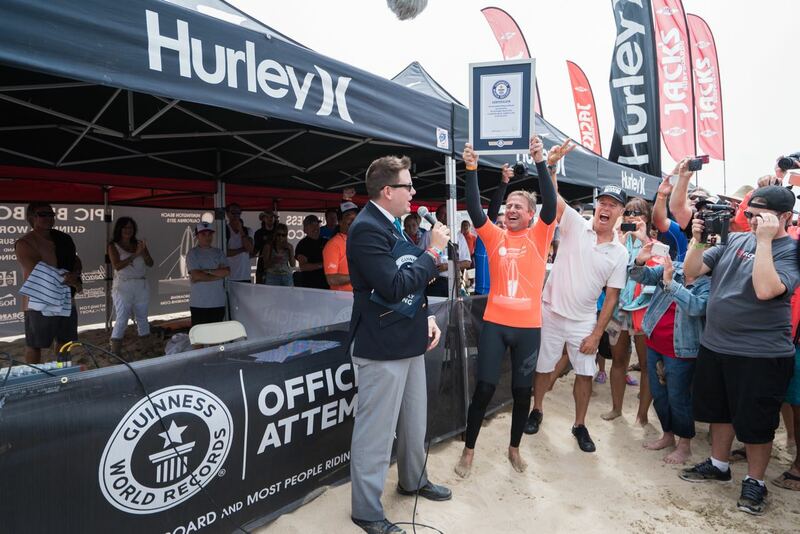 So it’s no surprise that this laid back surfing community made history once again last weekend by breaking not one, but two world records. Prior to this year’s Huntington Beach event, the record setting surfboard was 39.3 feet long, and the most riders officially recorded to ever catch a wave on a single surfboard was 47 – a feat that took place in Queensland, Australia in 2005. 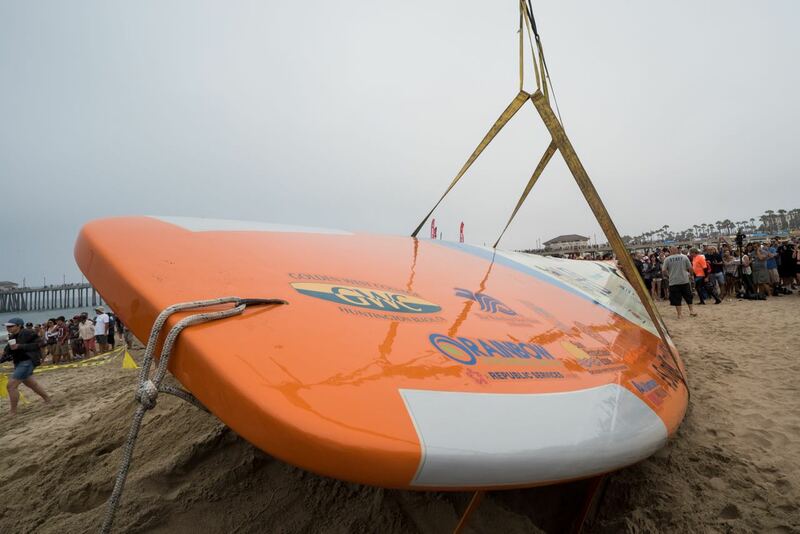 The multi-year effort to build the world’s largest board in Huntington Beach brought together aerospace engineers, pro-surfers, boat builders, and surfboard shapers, and the result was a 42 foot long, 16 inch thick fiberglass board that cost between $70,000 and $90,000 to make. 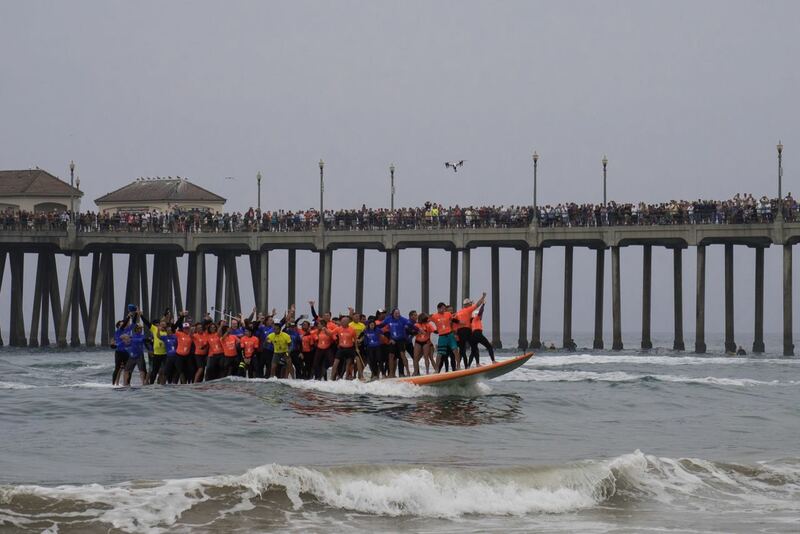 The morning of the event, thousands of spectators lined the beach and the Huntington Pier to cheer on 66 surfers who spanned multiple generations and would ride the board in unison. Team Leader Rocky McKinnon (in yellow) organizing the group of 66 surfers. The group included world champion Peter ‘PT’ Townsend, Surfing Walk of Fame inductee Scott Farnsworth, and many more world renowned heroes from the surfing community. Bob ‘The Greek’ Bolen, who has been surfing Huntington’s waters since 1958. 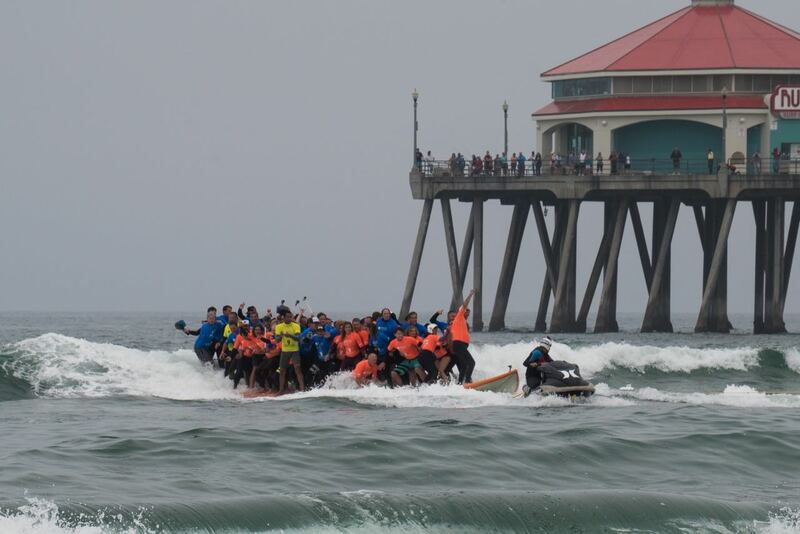 In order to beat the current record, the participants would need to catch a wave and stay on the board for a minimum of 10 seconds. 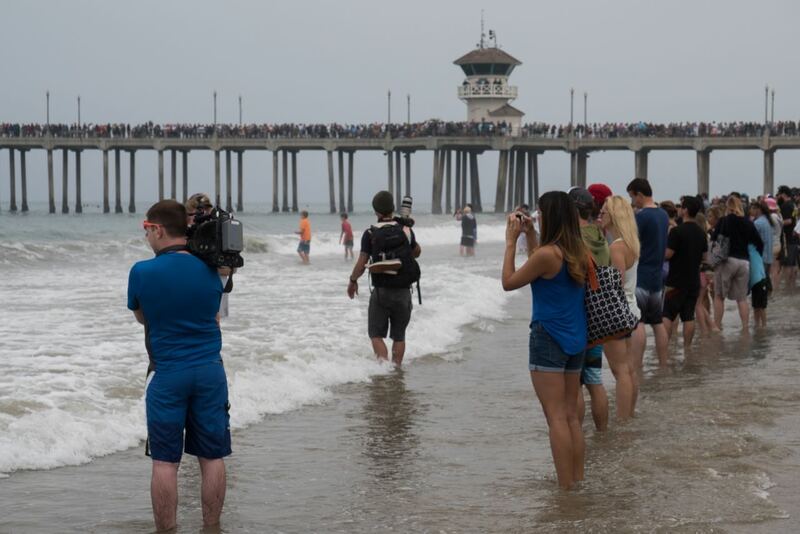 As a pair of wave runners pulled the board out past the break, the crowd waiting anxiously with cameras in hand to see whether the herd of surfers would be able to pull it off. Rocky McKinnon, a former pro-surfer and local custom paddle board builder was the one responsible for calling the wave. As the surf approached, McKinnon waited for the perfect barrel and then commanded the group to take their positions as the board caught momentum. Fourteen seconds later, the board approached the shore with every single surfer still standing, breaking the previous world record. 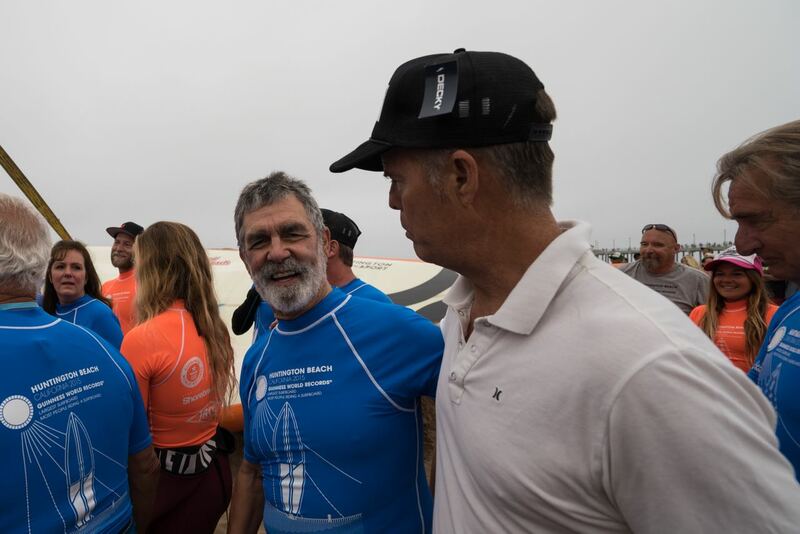 Following the successful ride, Guinness Book of World Records adjudicator, Michael Empric, made it official that the a new record had in fact been set for the most people to successfully ride a single surfboard at once. The other record for the world’s largest surfboard is still awaiting confirmation but is expected to awarded in the upcoming months. A big congrats to the surfers and the community of Huntington Beach. 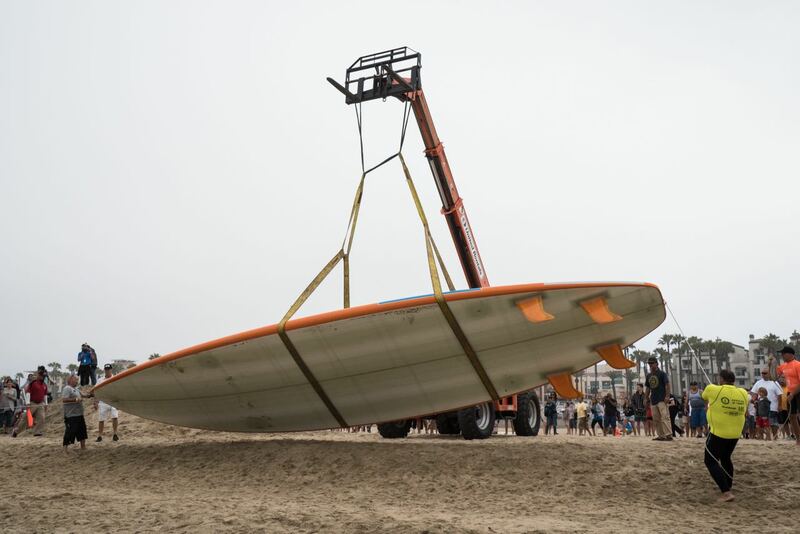 The surfboard, which had to be transported by a crane, is being relocated to the International Surfing Museum, where it will be on display so vacationers and surf enthusiasts can relive this exciting moment in Huntington Beach history.